Automatic finishing system with a travelling Evolution press to speed up the eyeleting process. 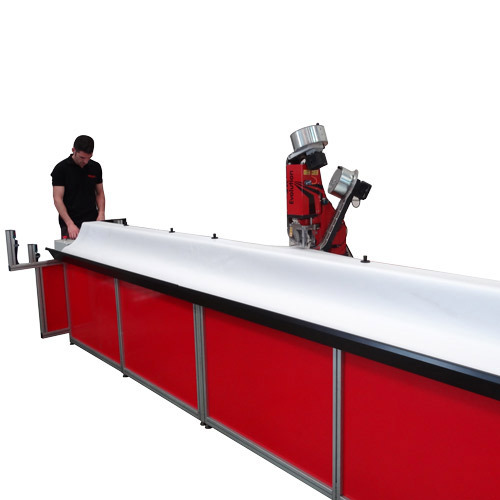 Operator loads the banner on the machine and aligns it with the alignment tool and magnets. Automan takes reading of the banner length with an optical sensor. Operator inputs on the touch screen distance from the edge of the FIRST and LAST eyelet. Inputs either distance between eyelets or number of eyelets required, making the PLC the calculations before starting the eyelet setting process.